Hong Kong/Beijing: China may prevent foreign investors from taking control of domestic brokerages, a setback to Wall Street’s ambitions to tap the world’s fastest growing stock market, people familiar with the planned new rules said. Overseas companies will be limited to owning stakes in publicly traded brokerages only, with the foreign holding capped at 20%, said the two people, asking not to be identified before the rules are approved. Foreign firms aren’t licensed to set up their own brokerages in China. JPMorgan Chase & Co. and Merrill Lynch & Co. are among global securities firms seeking to build operations in China, where 47 million new stock trading accounts have been opened this year. The rules, a precursor to lifting a bar on foreign investment in brokerages, give an edge to Goldman Sachs Group Inc. and UBS AG, which were earlier granted control of local units after negotiations with regulators. This is “a step which will limit foreigners’ ability to take control of a broker in the same way as Goldman Sachs, UBS," said Tim Ferdinand, vice-chairman of Euro Securities Ltd, the Chinese investment banking venture of CLSA Ltd. “Foreign investment banks will have?to accept that the Chinese are not going to open their financial markets quickly." The China Securities Regulatory Commission (CSRC) has submitted the draft rules to the state council, the nation’s highest decision-making body, they said. 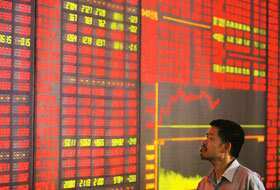 Market review: A man checks information at a stock exchange board in China. The nation’s booming market for stocks has made the shares of Chinese brokerages, including Citic Securities, more expensive. Liu Fuhua, a Beijing-based spokesman at the CSRC, declined to comment. Spokespersons at JPMorgan and Merrill Lynch in Hong Kong also declined to comment. Previous investments in Chinese securities firms were made by special arrangement with regulators. Morgan Stanley helped set up China International Capital Corp. (CICC) 11 years ago, taking a 34% stake in the nation’s first investment bank. The New York-based firm surrendered?management responsibilities at CICC in 2000 following a dispute with the Chinese firm’s management. UBS, Europe’s biggest bank by assets, won approval in June last year to set up UBS Securities Co. The Zurich-based firm holds a 20% stake in the firm it bought for $210 million (Rs835.8 crore). UBS had said in September 2005 that it will manage the firm. Goldman has a 33%-owned investment banking venture with Beijing Gao Hua Securities Co. Goldman loaned about $100 million to mainland banker Fang Fenglei to set up Gao Hua. Goldman’s Hong Kong-based spokesman Edward Naylor said the firm doesn’t disclose details of the arrangement. The new rules at least set a level playing field for new entrants, CLSA’s Ferdinand said. “What was very frustrating for foreign investment banks was that nobody knew who was going to be next to be given a special exemption," he said. “Nobody knew what to propose?to?the?CSRC in order to get such a special exemption." Foreign firms can take 33% of investment banking ventures with Chinese partners, allowing them to directly engage in underwriting stock and bond sales, the people said. These ventures may be granted brokerage, asset management and advisory licences over time, the people said. No deadline was given for extending licences. The nation’s booming market for stocks has made the shares of Chinese brokerages, including Citic Securities Co. Ltd, more expensive. Citic, the world’s fourth biggest securities firm by market value, reported in August first-half profit jumped more than five times from a year earlier. Trading commissions contributed 62% of sales, while its underwriting business accounted for only 4.4%. Citic’s market value has risen to 320 billion yuan (Rs1.7 trillion) today from 10.5 billion yuan in March 2005. Its stock price of 96.71 yuan values the firm at 34.8 times estimated earnings for this year, compared with 9.48 times for Goldman Sachs. China’s stock markets have almost tripled in size this year. The $3.37 trillion value of the firms traded in Shanghai and Shenzhen trails only London, Japan and New York, according to Bloomberg data. Total trading accounts in China have swelled to 125 million. In the US, brokerages manage more than 83 million accounts with total assets of $3.85 trillion, according to 2006 statistics from the Securities Industry and Financial Markets Association. The Financial Times earlier reported China planned to allow investments of as much as 20% in existing brokerages. Buying into a failed, closely held securities firm would allow foreign investment banks to negotiate for management control. “It’s going to be easier for the regulators to control the foreign shareholder if the company is a publicly listed company," Ferdinand said. “There’s not a lot of opportunity for behind-the-scenes deals."